A few weeks ago I created a homemade guacamole recipe for the blog, with the idea that I’d introduce a couple of guacamole recipes that are more than just the dip – after all, guacamole is a fairly healthy, low-fat food, so why not find more ways to get it into my diet? So I recently asked myself, what’s the one thing that can make guacamole even better? The answer, it turns out, is the one thing that makes almost any meal better… melted cheese. 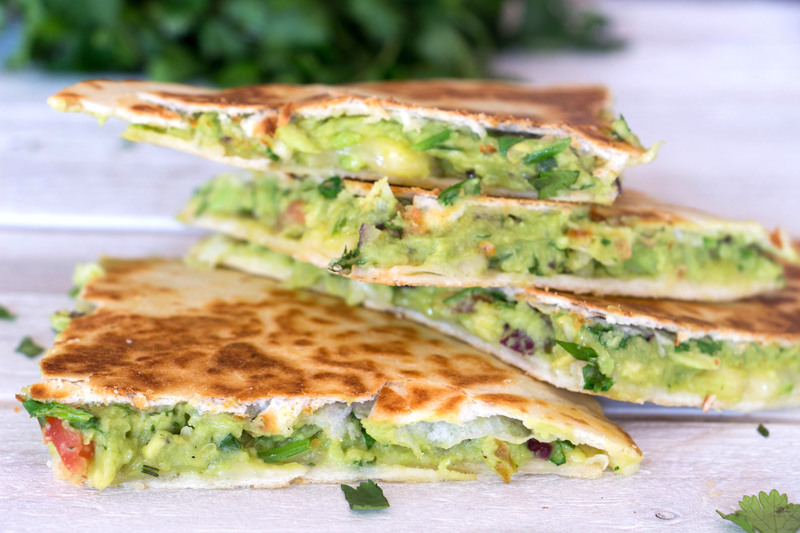 So I decided to pair these two awesome ingredients and make a delicious and unbelievably quick lunch recipe – guacamole quesadillas. 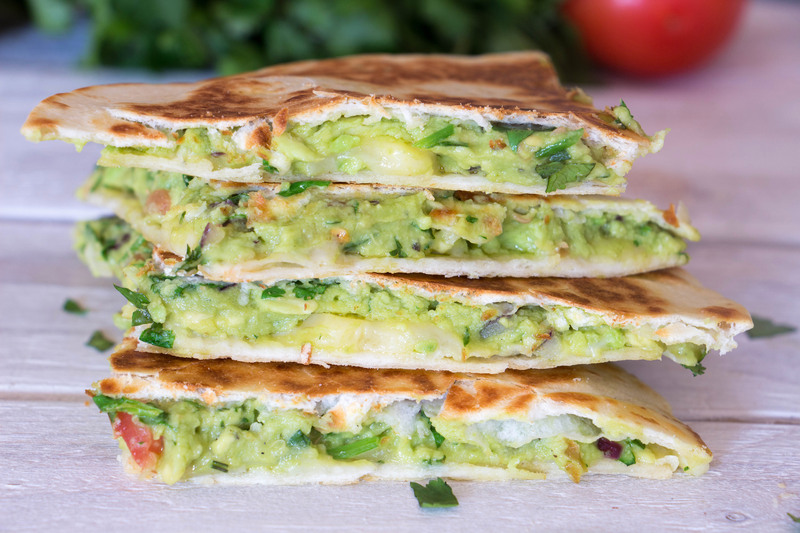 What’s great about this recipe is, if you have yourself some guacamole, all you need is a couple of tortillas and some cheddar cheese and you’re basically done! To make the guacamole, mash the avocados in a large bowl and then throw in the rest of the ingredients and mix it all together. Get a large pan and place it on a medium heat. Get the tortillas and brush 1 side of each lightly with olive oil. Put one tortilla oiled side down in the pan and place half of the cheese evenly on the tortilla. When the cheese has almost melted, spread half of the guacamole on top of the cheese, almost to the edge of the tortillas, sprinkle half of the cilantro on top, the cover with the second tortillas, oiled side up. Cook for another minute, until the bottom tortilla is slightly toasted, then flip it, so that the second tortilla is now toasting on the bottom. After 2 minutes, the second tortilla should also be toasted. Remove the quesadilla from the pan and repeat the process for the second quesadilla. Cut the quesadillas into quarters and enjoy! I love this dish and so did my family..